Without a doubt, Friday night in Airdrie was the highlight of the Copperheads weekend. The Snakes played a very disciplined sixty minutes stealing the Airdrie Thunder 18-0 winning streak. Opening sole goal for either goal in the first period came from overage player Jayden Smith. Second period saw a goal from the Snakes Jared Bainbridge, and one single for Airdrie. Third period the Copperheads took even more charge popping two more in at the first six minutes of the period. Airdrie at 12:52 received their second but could not rattle goaltender Nolan Berner for anymore. Final score was 4-2, ending the Thunder’s streak. Ten Copperheads received one point each on the scoresheet so very much a team effort game was displayed. Saturday and Sunday we were back at home at the Snake Pit. Past HJHL champions, the Red Deer Vipers, visited first. It was an evenly matched game similar to the Friday match up. After two periods the game was tied 2-2. Jedd Horvath opened the Snakes goals followed by Bainbridge getting the second of the night similar to Friday. The Snakes powered out come the third period allowing two to the Vipers taking a 4-2 loss. Both teams had 34 shots a piece with goalie Brant Mack playing the full game. On Sunday, the Strathmore Wheatland Kings couldn’t create any goals as they took a 4-0 loss against the Snakes. Levi Anderson had a four point night (3-1), Jayden Smith and Bainbridge both had the singles. Berner received the shut out stopping 32 Wheatland Kings shots. 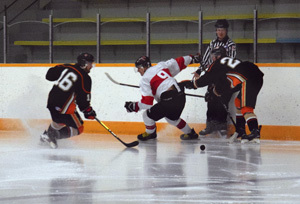 Next home game is on Saturday, Nov. 24, at 8:30 p.m., against High River Flyers. It is a special theme night, asking all fans to wear your favourite jersey to the game. All participants will receive a free future game voucher ticket. The Copperheads apologize that they can’t participate in the years hometown Christmas parade, as they have an away game on Friday against Lomond.